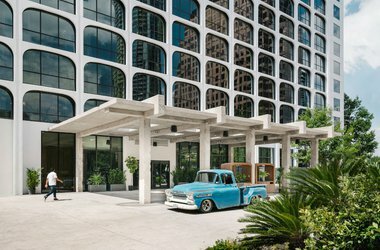 The 428-room hotel brings together all corners of Austin in a chic rock-meets-ranch vibe. Staying true to the brand's design ethos, the commitment to Austin styling makes it the perfect backdrop for local art installations, an awesome infinity pool, a lakeside restaurant delivering a bounty of Central Texas produce, and a greenhouse-inspired rooftop lounge specializing in handcrafted drinks and incredible sunset views. Read more on Fathom. Sunny, spacious, great-looking, communal, and with a very nice little to-go coffee counter serving cinnamon buns and migas and other things that will destroy any hope of eating well for the day by about, oh, 9 in the morning. While the aesthetic is super design-forward, prices are super affordable. Great for couples, families, groups, and solo travelers who want to feel like locals. 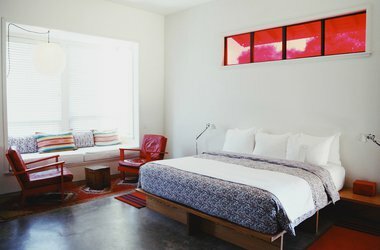 East Austin's chic, seven-room hotel is on a mission to deliver a wholly Austin experience. There's local art, furniture, coffee, and beer, and a concierge dedicated to showing off its local knowledge. 1609 E Cesar Chavez St.
Hardwood floors, muted colors, and walk-in showers stocked with Aesop products bring a modern twist to the South Congress antique shopping street. Rooms and public spaces are flooded with light — opt for a suite with floor-to-ceiling windows and/or balconies for even more sunshine. See if you can score a seat at the twelve-seat Otoko sushi bar by local food-hero Paul Qui. 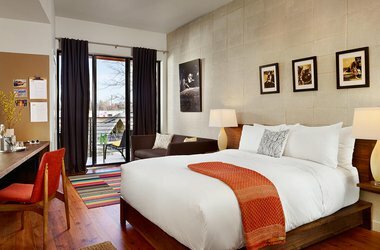 A music-themed Kimpton hotel in the historic Rainey Street district. 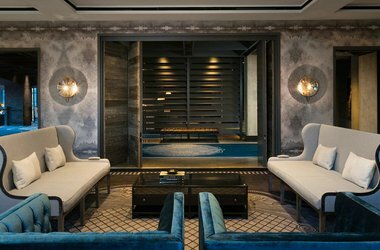 Dark wood, metallic accents, and leather finishes in the lobby and guest rooms reinforce edgy, rock 'n' roll vibes. Don't miss drinks and live music at Geraldine's. 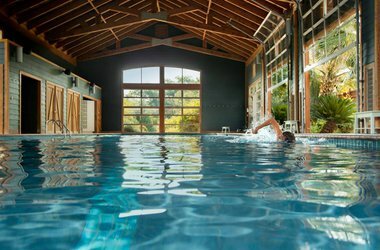 A 35-minute drive from the airport gets you to the shores of the Colorado River and the best spa retreat in Texas Hill Country. Rooms are spacious and comfortable. Some have private jacuzzis; all have views of the lake. Every room comes stocked with the spa's handcrafted, signature skincare line in two scents, Lavender Fields and Gifts of the Garden. 1705 S. Quinlan Park Rd. 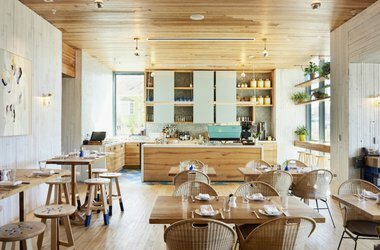 Just off the noisy South Congress Avenue, Kimber Modern is an oasis hidden under a canopy of oaks. Take refuge in minimalist and thoughtful design, bright light pouring through the floor-to-ceiling windows, and downtime on the patio hammocks. Book early — the seven rooms fill up fast. 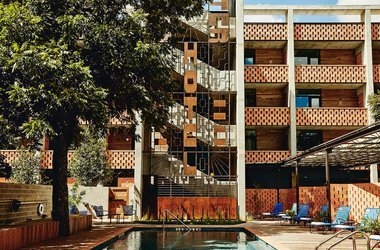 Austin's quintessential boutique hotel — low-key, casual, cool, and stylish — was constructed from an old motel. Props for the best micheladas in town and fabulous kimono bathrobes, custom-made for the hotel's guests. 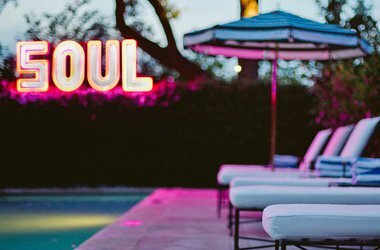 Named after the patron saint of music and poetry, the five suites in this small hotel (three studios, six poolside bungalows) are each inspired by a pop-culture icon. We love the idea of bathing in a private, bamboo-lined outdoor shower in the Patti Smith suite. 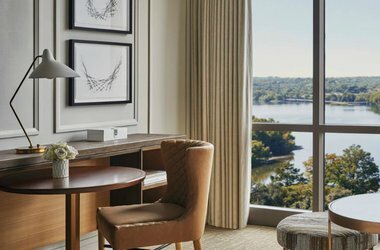 It's hard to feel fancy in Austin, but the hotel's bar (complete with celeb sightings) may be your best bet. If you have a room with a balcony that faces the lake, you can watch the bats fly out of the Congress Street bridge —a beloved city pastime. Built in 1886, it still stands today as a vestige of historic Austin. 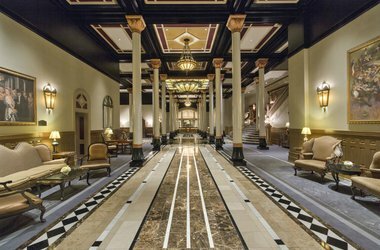 The stained glass dome and art-deco lobby reinforce the space’s antique charm, but newly renovated rooms give you the best of both worlds. 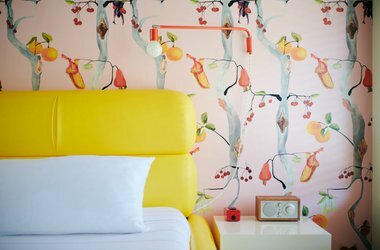 Each of the 41 rooms are individually decorated with bright colors and vintage furniture. This SoCo spot, open since 1938, is cozy, unpretentious, and close to everything cool (Jo's Coffee, Continental Club, and some of the city's best antique shops). Plus: It's always a fun scene at the kidney-shaped pool.